What goes up must go down: so are the global equity markets heading for a fall? Last week, global equities hit another all-time high. The MSCI World Index rose to a record level, the value of all the companies in the S&P 500 crossed the $20 trillion mark for the first time ever and the FTSE 100 closed above 7,300. With the bull market that started in 2009 seeming long in the tooth, should investors now start getting nervous? After all, what goes up must come down – right? Despite the fact that the US generates only 16pc of global GDP, the main driver of equities right now is what is going on in America. Trade policies, the rising dollar and hopes for the Trump administration’s reflationary policies – tax cuts and increased fiscal spending – are setting the global agenda. http://enterpriseuk.co.uk/wp-content/uploads/2016/05/31.05_Faltering-services-sector-points-to-slower-UK-growth.jpg 500 1000 Cagatay Kirici http://enterpriseuk.co.uk/wp-content/uploads/2017/06/EmtUK_FinancialEcosystem-300x98.png Cagatay Kirici2017-02-20 16:22:322017-02-24 19:03:16What goes up must go down: so are the global equity markets heading for a fall? Greg, well thanks very much for your time, Co-fund Manager of the PSG Equity Fund, let’s start by talking about equity markets? The equity markets are effectively a list of exchanges, so this is where shares are bought and sold and they represent holdings in underlying businesses and these are companies that you will be familiar with and sometimes companies that you’re not, there is a broad range of companies listed on the South African Stock Exchange, over 300 and then many thousands on global stock exchanges. When you’re buying a piece of paper which is a share certificate and it’s a share traded on an exchange, you’re actually buying an underlying piece of the business, so you become a business owner, which is very, very exciting about the equity markets, you can sit in your office or you can be in the gym or what have you, but you own a piece of the business and the company that you have a shareholding in, they’re effectively working for you. If you view it that way, the rest of the discussions that we have will become quite simple. Why is the equity market a good place to be as opposed to any other market, why not go into the bond market, for example? Well, there are actually good opportunities in all the markets that we invest in, so bond markets, particularly in South Africa at the moment and equity markets, but over the long-term, anecdotal evidence has shown that equities have outperformed. They are seen as more risky and there’s a view that if things are more risky you need to actually get a higher return, but over time equity markets do compound, which means that they do grow at a faster rate than the other markets. That creates an opportunity for long-term investors. If you pick the right companies, companies that will grow over the long-term, you will be able to create more wealth if you’re investing in the equity markets. How do you pick these companies? I’m going to rely on you to do it for me by investing in your fund, but how do you do that, how do you exploit the equity market? Well, there are a number of investors, or a number of people in the world who are looking at investing in the stock market, so the markets are generally regarded as quite efficient, which means that they normally, a lot of the information that is seen in the newspapers is generally priced in quite quickly, but we at PSG Asset Management have a very simple process that we follow to try and get the odds in our favour to be able to outperform the general markets so we can actually create more wealth for our investors than if you were just to buy the average index. Our process is a very simple one. We call it our “three Ms”, so we’re looking for businesses with a very strong moat. If you go back to medieval times, a moat was a wall of water around a castle to protect that castle. With all eyes on the U.S. stock market and the return of the “Trump trade,” few investors are focused on global equity markets. It is easy to see why. Global stock markets have disappointed investors so much, for so long, that most simply have stopped looking at stock markets outside the United States altogether. The go-go years of the late 1990s, when emerging stocks soared by double-digit percentages year after year, have long faded from financial memory. Yet, it’s precisely at the point of capitulation – when all investors have thrown in the towel – that stock markets bottom and tend to enter into a stealth bull market. Although we are only six weeks into the New Year, 2017 just might be the year that global stocks finally make their long-overdue comeback. I track 47 global stock markets on a daily basis. I cover these particular 47 because each is a global stock market in which you can invest readily through exchange-traded funds (ETFs). There is no point in getting excited about the rip-roaring Hungarian stock market if there is no ETF in which you can invest. Still, with global stock markets performing so poorly in recent years, you may be wondering: “Why bother?” After all, among these 47 global stock markets, the U.S. stock market has dominated the performance tables for over a decade. The broad-based Vanguard FTSE Emerging Markets ETF (NYSEARCA:VWO) is already up 9.17% this year. That means that emerging markets are outperforming the S&P 500’s Trump-fueled gain of 3.99% by over 2 to 1. Six weeks into 2017, a whopping nine out of 47 global stock markets I track are up by at least double-digit percentages. Three of these markets are up by over 15%. These are the kind of numbers that get investors’ blood flowing. In another six months, these same investors may start partying like it’s 1999. U.S. companies are preparing to invest again after years on the sidelines, and rising interest rates are unlikely to impede them. The Federal Reserve last month signaled interest rates would rise at a faster pace than previously projected, showing increasing optimism about the U.S. economy as it unanimously approved its second rate increase in a decade. Despite years of near-zero interest rates that made borrowing cheap, many big U.S. corporations have been hoarding cash or plowing money into safer pursuits in the wake of the recession. Some, like General Motors Co. and railroad CSX Corp., borrowed to prop up pension plans. Others, including Home Depot Inc. and Yum Brands Inc., used cheap debt to repurchase shares. Meanwhile, overall spending on building new factories or upgrading aging equipment languished. That is likely to change soon. “We could be in store for a significant [capital-expenditure] boom,” said Charles Mulford, an accounting professor at Georgia Institute of Technology in Atlanta. Steel company Klöckner & Co., which generates about 40% of its sales from its 50 sites in the U.S., expects to increase spending on steel-shaping machinery here in the coming year. The German company delayed such U.S. investments when demand slowed from industrial customers that make everything from railcars to storage tanks for oil producers. Rising interest rates won’t interfere with the planned investments, said Gisbert Rühl, chairman of Klöckner’s management board. “If we have to pay 100 basis points more, that’s not an issue for us,” Mr. Rühl said. “Even 200 basis points is not an issue…It’s still cheap.” Fed officials have signaled that they expect to raise rates by another 0.75 percentage point this year, likely in three quarter-point moves. The new optimism could mean the U.S. is poised to emerge from a pattern that has frustrated the usual business investment cycle. During downturns, businesses typically cut capital investment — spending that increases or improves physical assets like buildings, equipment and computers. As the economy picks up, they rapidly ramp up spending, or risk being overtaken by more aggressive competitors. Business investment dropped sharply during the financial crisis, falling more than 17% for S&P 500 companies in the 12 months after Lehman Brothers’ September 2008 collapse. But even as the economy recovered, total expenditures took three years to regain the precrisis level, according to data from S&P Dow Jones Indices. Companies saw little reason to invest when U.S. economic growth was sluggish. Quarterly gross domestic product has averaged an annualized 1.5% growth since the Lehman collapse, compared with a decadeslong average — going back to 1930 — of more than 3%. Another culprit was a resistance among corporate leaders to lower the minimum rate of return on investment — known as a hurdle rate — they would accept from new spending, largely out of fear of disappointing shareholders. “If returns are down and your hurdle rate hasn’t changed, you’ll stop investing,” said William Plummer, finance chief at construction rental firm United Rentals Inc. Instead, many businesses pursued safer alternatives. In 2015 alone, companies in the Russell 3000 index bought back nearly $700 billion of their own shares, the most since 2007, according to research firm Birinyi Associates Inc. Last year through November, those firms spent another $488 billion on buybacks. Companies in the S&P 1500 pumped $550 billion into their pensions between 2008 and Nov. 30 last year, according to Mercer Investment Consulting LLC. he All- Share index was first calculated in April 1962 at a maiden value of 100. At the time of writing in mid-September 2016, the index stands at around 3,650. The capital value of the index has compounded at nearly 7% a year over the 54 intervening years, and that return takes no account of the additional rich flow of dividends paid by UK companies. A similar performance through to 2,070 would lift the index to around 134,000. Is that feasible? Well, one of my favourite quotes about the future comes from the historian Thomas Babington Macaulay. So why should it not be? Of course, as an investor, you want to know what is going to happen next, not over the next 54 years. What I always say to that is that I expect UK equities to be much higher in 10 years’ time. My view is that price/earnings ratios will shoot up, as real earnings growth accelerates. I also think quoted companies’ capital intensity will decline as digital assets replace physical ones. That’s the good news. The less good news is that what will drive the market higher is the emergence of major new companies, sometimes in industries you and I haven’t heard of. That will make picking winners trickier. I say this not as a futurologist making controversial guesses about a brave new world. I say it as a historian of markets. For 200 years or more, technology has been the engine that moves markets, to borrow the title of “Sandy” Nairn’s excellent book (Engines that Move Markets). People try to predict the stockmarket by watching interest rates, GDP or even politics. But they’re looking in the wrong places. It is technology that is behind the successive waves of stockmarket returns. We’re lucky to be alive during a period of extraordinary innovation, but don’t forget that technology is always as busy destroying companies as it is creating them. That’s confirmed by the bewildering flux in the constituents of market indices over time. To get some idea of the scope of the changes that might unfold, consider the outlook for the 10 biggest members of the FTSE All-Share index today: two banks (HSBC (HSBA) and Lloyds (LLOY)), a tobacco firm (British American Tobacco (BATS)), two big oils (Royal Dutch Shell (RDSB) and BP (BP. )), three drug companies (GlaxoSmithKline (GSK), AstraZeneca (AZN) and Reckitt Benckiser (RB. )), a telco (Vodafone (VOD)) and a distiller (Diageo (DGE)). What might peer-to-peer lending, vaping, solar energy, gene sequencing, free telephony and – who knows – even the legalisation of marijuana do to these mega-caps over the next decade? We’ll need regular shots of Johnnie Walker and Gaviscon to calm our nerves through the coming changes. Banks helped to support British blue-chips on Thursday, buoyed by good performance from U.S. lenders in key business areas on a volatile day as the European Central Bank held policy steady. British mid-caps were also in focus, hobbled as the FTSE 250 .FTMC was hit by a series of profit warnings. The FTSE 100 ended up 4.98 points, or 0.1 percent, at 7,026.90, following a volatile session. Top risers were Royal Bank of Scotland (RBS.L) and Barclays (BARC.L), up 3.5 and 3.2 percent respectively. Traders said good results from U.S. banks were helping the sector, especially lenders such as RBS and Barclays that have substantial Fixed Income, Currency and Commodity (FICC) trading operations. Analysts at JP Morgan Cazenove said it expected “this trend of FICC outperformance … to continue” in the European earnings season, and cited Barclays as a stock which would benefit. On Thursday, BNY Mellon (BK.N) was the latest in a series of U.S. banks to post expectation-busting results. Volatility in afternoon trade was exacerbated by a meeting of the European Central Bank. The ECB kept rates steady as expected, and trade was choppy after ECB President Mario Draghi said the central bank had not discussed at its latest meeting either ending its asset-buying programme, also known as quantitative easing, or extending it. Shares dropped initially, but recovered following a fall in the euro and bonds yields as Draghi struck a more dovish tone. The mid-cap FTSE 250 .FTMC fell 0.5 percent, hit by profit warnings. Cyber security company NCC plummeted 35 percent, its biggest-ever daily decline after it faced some contract cancellations and difficulties with some renewals. Mid-cap engineering companies Keller (KLR.L) and Senior (SNR.L) slumped 27 percent and 20 percent respectively after both issued profit warnings. Among blue chips, WPP (WPP.L) fell 3.6 percent after Publicis Groupe (PUBP.PA), down 5.7 percent, said third-quarter sales grew by just 0.2 percent on an organic basis following the loss of large media accounts in the United States in 2015..
Concern about advertising revenues hit British broadcaster ITV (ITV.L) as well, with its shares down 3 percent after broker Liberum cut its target price for the stock. However, airline stocks found some solid ground after German airline Lufthansa (LHAG.DE), up more than 7.9 percent, increased its profit target for the year..
Shares in British Airways owner IAG (ICAG.L), easyJet (EZJ.L) and Ryanair (RYA.L) rose 0.9 to 3.4 percent. The divergence between the internationally focused FTSE 100 and domestically focused FTSE 250 begins to show as earnings reports caution on Brexit. The outlook for companies with operations focused on Britain’s domestic economy is starting to look gloomier as firms begin to report earnings from the first full quarter following the U.K.’s vote to leave the European Union. Travis Perkins (TPRKY), a building materials supplier, has fallen 6.85% in London as the FTSE 100 lost 0.33% to sit at 6,977.11 after saying it will likely miss full-year earnings expectations. It’s shares have lost 37% since the June 23 referendum. Foxtons, Britan’s dominating real estate agent group, said Wednesday that lower property sales in London have pushed sales revenue down by a third. Shares in the company have gained 3.17% today. And this could be just the beginning with the divergence between the FTSE 100 and FTSE 250 becoming more important. The fall in the pound, which has slid about 19% since the Brexit vote, has propped-up the internationally focused FTSE 100. Credit Suisse recently calculated that London’s benchmark index’s constituents collectively earn about three-quarters of their revenues from outside the U.K. The FTSE 100 is up 10% since the June 23 vote and is now hovering at record highs. The domestically-focused FTSE 250 is, however, a different story, having only gained 3.44% since the referendum. Its constituents are exposed mainly to the British market, which three months on from the Brexit vote is now feeling the pinch. Market uncertainty has worsened since Prime Minister Theresa May looks to be favoring a “hard Brexit”, or more simply, a divorce from the EU that does not allow the U.K. access to the single market. Lack of access to a single market could prove to be a sticking point with these smaller FTSE 250 companies that trade with Europe. Both Travis Perkins and Foxtons have expressed concern for their businesses since the referendum. Travis Perkins has said that it expects 2016 core earnings to be “slightly below” the current market consensus of £415 million ($509 million). It has decided to close more than 30 branches and make further efficiency changes in the supply chain. The company said demand remained “softer” throughout August and September and remains “uncertain” going into next year. Foxtons, on the other hand, said home buyers shying away from transactions in the wake of the Brexit vote due to higher property taxes will hit their bottom line. Quarterly sales revenue came in at £12.2 million pounds for the three months ending September 30, down from £18.5 million in the same time period last year. It warned in June that the vote would lead to less transactions that would probably last until the end of the year. However, in its Wednesday statement the company said tight cost controls will help deliver full year results in line with expectations, prompting the boost to shares. These warnings are expected to be just the beginning as inflation increases and consumer confidence falls. Data from IHS Markit released Wednesday show that U.K. households saw a noticeable downturn in their finances for the first time since the vote. A household finance index fell to 43.8 in October, a five-month low and down from a reading of 44.7 the previous month. Is The Writing On The Wall For The FTSE 100? The pound has been the focus of investors’ concerns about a Hard Brexit; while the pound has experienced a ‘flash crash’ and plunged to its lowest level in more than 31 years versus the dollar, the FTSE 100 has quietly jumped above 7,000 and threatens to break to a fresh record high. But could the FTSE 100 be the next victim of the Hard Brexit rhetoric currently coming from Whitehall? If we look at the bond markets for guidance then we believe there is reason to be cautious about the outlook for the FTSE 100. UKUK 10-year bond yields have risen above 1%, for the first time since June, rising more than 50 basis points since bottoming out in August. This is worth noting. Bond investors are considered to be ‘rational’ and informed investors with long-term views, thus when there is a shift in the direction of a bond market (bond yields move higher, bond prices lower as price and yield move inversely to each other), it can suggest a long-term shift in bond investors’ thinking. 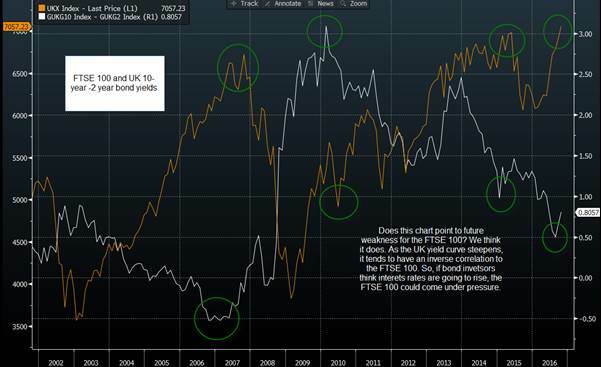 Figure 1 below shows the UK’s yield curve (white line) and the FTSE 100 (orange line). The yield curve shows 10-year yields minus 2-year yields. At the moment the spread between 10-year yields and 2-year yields is steepening, so 10-year yields are rising at a faster pace than 2-year yields. This suggests that the market expects interest rates to be higher in the future than they are now. It doesn’t take a rocket scientist to come to that conclusion since interest rates are currently at a record low, however, it is the pace of the increase in 10-year yields that may eventually cause jitters in the stock market. A steepening yield curve can be a sign that investors think inflation is set to rise. 5-year breakeven rates (a good way to gauge UK inflation expectations) have risen above 3% for their first time since 2013. Interestingly, the pace of increase has surged since the EU referendum vote in June. This suggests that rising inflation expectations have been directly driven by the sudden decline in the pound. A steepening yield curve is usually a sign of healthy economic growth: the economy expands, the BOE needs to raise interest rates at some point to stop the economy from overheating. However, the difference this time is that we have a major economic uncertainty hanging over us – the outcome of the UK’s Brexit negotiations. These negotiations could take many years, and we have no idea what the UK’s post EU exit economy is going to look like. Due to this, a steepening yield curve is a cause for concern – rising inflation caused by a decline in the pound could trigger BOE interest rate increases just at the time that the UK economy may need the support of the central bank. As you can see in the chart below, each time the FTSE 100 has peaked the yield curve has been flattening, in contrast, a steepening yield curve has coincided with future weakness in the FTSE 100, dating back to 2001. Thus, if history repeats itself (nb, it doesn’t always do that), the top-performing FTSE 100 could be on borrowed time if we continue to see a steepening yield curve. If you are a stock market trader, look at the bond market for direction. It is currently giving us a warning sign that the FTSE 100 may not be able to sustain its current gains and could be ripe for a sell-off. While a steepening yield curve does not have a perfect correlation with the FTSE 100, which makes it difficult to predict the timing of a potential sell off in UK stocks, it does suggest that UK equity investors should be cautious before adding to long positions at these high levels. http://enterpriseuk.co.uk/wp-content/uploads/2016/10/wall.jpg 500 997 Cagatay Kirici http://enterpriseuk.co.uk/wp-content/uploads/2017/06/EmtUK_FinancialEcosystem-300x98.png Cagatay Kirici2016-10-12 14:42:192016-10-28 20:40:43Is The Writing On The Wall For The FTSE 100? The Footsie has soared through 7000! Another 30 points and we’ll be at record highs! The economy is in its rudest health for a generation and basking in the prospect of a rapid EU exit! Don’t be fooled. The only reason shares are leaping is that the pound is tanking, boosting our exports and making profits earned overseas in dollars and euros more valuable in sterling. And the pound is falling because the world’s investors reckon Britain’s prospects are worsening. You can argue the toss about whether the markets are right or not, but you can’t deny the currency-equities connection. Ah yes, you may say, but what about all these upbeat surveys on the economy? Manufacturers, service companies and builders are booming. True, but it’s worth remembering that we haven’t actually left the EU yet. And, as Deutsche Bank economist George Buckley reminds us, surveys take a long time to react to shocks. Britain’s banking crisis began in August 2007, yet the GDP data didn’t turn negative until the end of October 2008. The PMI surveys didn’t fall until April and May 2008. I’m not saying Brexit will deliver anything like the shock of those awful days. Or that businesses haven’t proved surprisingly resilient to the referendum result. Their can-do optimism has been impressive, particularly in London, which has most to lose. But we shouldn’t believe these fairytale markets. Put that champagne back on ice. Jamie Dimon is a charmer. In his youth, he approached a woman at a Harvard Business School party and said: “Hi, I’m Jamie; you’re going home with me tonight.” She did, and later became Mrs Dimon. The trouble with charmers is that, sometimes, you have to take their words with a huge pinch of sodium chloride. Today, Dimon declared “there’s no reason” Deutsche Bank can’t bounce back from its troubles. Really? How about these: negative interest rates, lack of solvency, a sprawling, low-margin retail chain, Brexit, unknown derivatives losses, a Eurozone recession. Oh yes, and a looming, multibillion dollar fine from the US. As with that Harvard chat-up line, Dimon is just talking his own book. No bank wants to see the European banking crisis that would result from Deutsche’s demise. Even the mighty JPMorgan would suffer. Realistically, Deutsche won’t fail — Angela Merkel wouldn’t let it. But there are many reasons it could. Ignore Dimon’s attempts to persuade you otherwise.